Let's face it, when the Bad Guys are doing a LOT of good you can't help but be a fan. In 1977 I got to view the first movie in the Star Wars saga and it struck a chord with me. I had a tough-minded princess to root for, a young hero to cheer on, and a pirate to not trust. The white suited Stormtroopers and the black encased Darth Vader were the stuff of nightmares for this seven-year-old adventurer, and even today I unconsciously gristle when I see a set of TK armor pass by. But the 501st Legion and their heroic compatriots Capital City Jedi Knights, Rebel Legion, and Galactic Academy have caught the imaginations of our family. 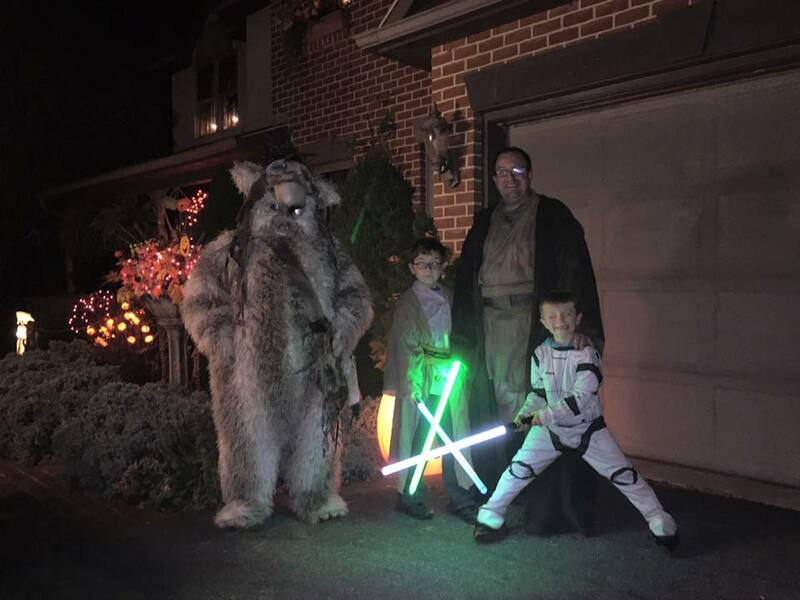 My husband is a light-saber-swinging member of CCJK and Rebel Legion Ghost Base, the boys are in Galactic Academy (kids under 18) and I joined Rebel Legion with my Logray Ewok costume. The CCJK have been demonstrating light-saber battling since 2010 throughout the Central Pennsylvania region. Matt's been involved since January of 2015 and enjoys the comeraderie and physical discipline. Galactic Academy grew out of a need for a kid's "trooping group" since their parents were involved with either the 501st or RL. 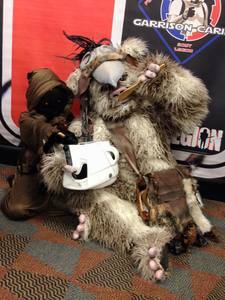 We had our first large-scale "trooping" event with the 501st Garrison Carida and Ghost Base Rebel Legion at Pittsburgh's Steel City Con(vention). 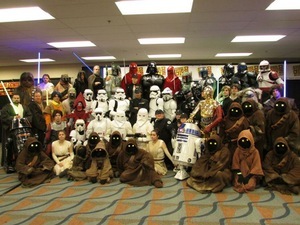 Over 50 participants produced upwards of 75 different costume changes and props - R2D2 units that whirred and whistled to the delight of young fans, to Jawas of various sizes, to a near 8-foot-tall Chewbacca who had a sound board to assist in his growling conversation. To watch C3PO prepare himself for his adoring fans with the help of his two assistants, or to giggle at the Biker Scouts making a fuss over their Endor rival, or to watch the Wilrow "Ice Cream Maker Guys" jog around the grounds looking for their escape pod was something to behold! Did I mention these groups also raise charity in the name of Lucasfilm fandom? Yep! We got to participate in Blast-a-Trooper to collect for Alex's Lemonade Stand that fights against childhood cancer. Year-round and world-wide these fan groups entertain and serve their communities while sharing their love for a time long ago in a galaxy not so far away. If you happen to run across a bucket head or X-Wing fighter pilot or Jedi in the next coming weeks let them know you've got the skinny on their motives. "Bad Guys Doing Good" isn't just a Grinch statement. May the Force be with you.